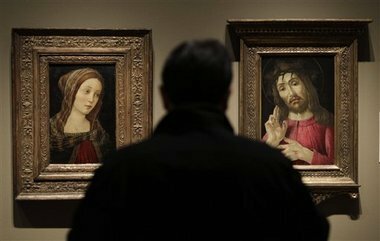 In the gallery on forgeries, a painting titled “A Female Saint”, left, that once was attributed to Italian artist Sandro Botticelli is exhibited alongside “The Resurrected Christ,” right, a Botticelli painting from around 1480. The display invites visitors to compare the works, looking to details such as brushstrokes that were clues to museum curators.at the Detroit Institute of Arts in Detroit, Thursday, Nov. 18, 2010. A new exhibit opening Nov. 21 titled “Fakes, Forgeries, and Mysteries” about how experts figure out whether art works are authentic. Remember learning in elementary school that you could tell the age of a tree by counting the rings inside the trunk? A similar, although vastly more sophisticated method, called dendrochronology, can be used to help ascertain the authenticity of a painting. This Virgin and Child (left), painted on an oak panel, entered the DIA collection in 1889, attributed to an anonymous, late-fifteenth-century Flemish artist. By 1928, the panel had been reattributed to a German painter known as the Master of the Life of Mary, who was active from 1460 to 1490. Since then, the date that the picture was painted and, by extension, who painted it, have become a matter of debate. This is where dendrochronology comes in. When an artist needs a piece of wood for painting, a panel, about one-quarter-inch thick, is cut from the bark to the center of a tree, and an image is created on the flat surface. The two thin sides of the board, cut against the wood grain, are a cross section of the interior of the tree, and it is there that growth rings can be counted. More importantly, the spaces between the rings can be measured: thicker spaces indicate wetter seasons and the thinner areas drier ones. The data from the panel is than compared to a master timeline of tree rings and patterns, created from wood samples taken from buildings and other structures with known dates of construction. The master timeline, which covers Northern European tree growth for the past six hundred years, was compiled by a team of scientists from the University of Hamburg, led by Peter Klein, a professor of wood biology. Klein came to Detroit to examine the Virgin and Child panel. Using a high-power magnifying glass, he counted 310 growth rings. The pattern of rings is consistent with trees originating in southern Germany at the end of the 1500s. When the panel was crafted, some parts of the tree were lost, along with the corresponding rings, so a few years are added to the date to compensate, establishing 1610 as the plausible year for the felling of the tree. A few more years are added to take into the account the time it takes for the drying and seasoning of the wood. Thus, the earliest date for creation of the painting is 1613. The DIA painting, whether by a Flemish or German artist, clearly does not date from the late 1400s as originally thought. The painter remains unknown, but was probably an artist working in the 1600s in an earlier style. Timed tickets are necessary to view the exhibition. Click here to purchase them. Members see the exhibition free. Don’t forget to bring your cell phone to access Director Graham Beal’s audio commentary on the exhibition. Using the system is as easy as dialing a telephone number and then entering the item number that corresponds to a particular image. More than one image may be viewed per phone call. The cell phone gallery guide is provided free of charge; however, you will use your cell phone minutes while connected, regardless of your carrier. A printed copy of the tour is also available.